I've been away on Wordpress blogging about our community garden for a while and find myself in unfamiliar territory but it will all come back to me soon enough. I'm anxious to make contact with my carry-a-bag friends and followers now that the site is back online and I'm back behind my sewing machine. of bobbins, buttons and threads and find the lure of selecting, matching and making impossible to resist. My time outside gave me the opportunity to watch bees and see how many sorts there are and each has its own task - buzzing, busy and determined. I think I may be a Solitary Bee as I'm very happy to work alone, as long as I have 6Music on nice and loud. However, I'll be venturing out to dip my toes into the exciting world of the Pick Me Up design fair at Somerset House this week where I'm running a tote bag making workshop using the new HEALS 1812 fabric range. Very exciting. - come and visit, make a bag and take it home. Nice Post. Plastic bag is become a necessary item it current situation. We provide reusable non woven bags...Check our link for more info. Thanks for sharing. Great idea! 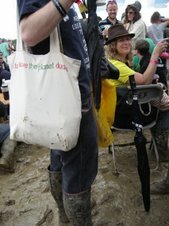 forest and lakes offer free canvas bags for designer. Carry-a-bag began about five ago when I was fuming about plastic carrier bags stuck in trees, washed up on the beach and generally messing up the planet. 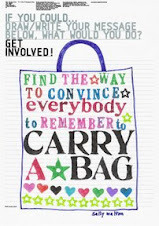 It began as a little idea but one morning I woke up thinking "don't take a carrier bag just remember to carry a bag. And now I make bags all the time.